HMCS Annapolis Artificial Reef | Gambier Island, Vancouver B.C. New Wreck Site Coming To Juno Beach, Florida in June 2018 (11/05/2017) As the president of Artificial Reefs International, Joe has had a hand in the sinking of some truly iconic wrecks such as Key West’s USS Vandenberg, so he is no stranger to the incredible benefits that these sites can bring to the ecosystem and divers alike. Retailer joins efforts to turn South Carolina submarine into an artificial reef (10/16/2017) A division of a South Carolina clothing company has joined an effort to turn a World War II submarine on display at Patriots Point into an artificial reef off the Florida coast. Days Numbered for Clamagore sub at Patriots Point (1/31/2017) The board of county commissioners in Palm Beach County, Fla., unanimously voted to pay $1 million toward the submarine’s being cleaned, towed and sunk in 90 to 100 feet of water off of Jupiter or Juno beaches. The contract will be voided if Artificial Reefs doesn’t raise the remaining $3 million from private sources within a year. Another Artificial Reef May Soon Hit Florida Waters (1/21/2017) County officials unanimously approved $1 million for the project, to be sited 1.5 miles off Juno Beach, just south of Jupiter, at about 75 feet. The county’s commitment represents about a quarter of the estimated $4 million needed overall, says Joe Weatherby of Artificial Reefs International – USS Clamagore. Palm Beach County OKs $1 million for sinking sub as artificial reef (01/11/2017) The museum signed a deal last spring with Artificial Reefs International-Clamagore, a subsidiary of Miami-based CRB Geological and Environmental Services, to find a home for it somewhere in the ocean. Total cost for the project could be as much as $4 million, but ARI parent CRB-GES has said it plans to raise the balance through sponsorships and other sources. Florida board votes to accept Patriots Point sub for underwater reef (01/10/2017) Palm Beach County agreed to pay $1 million for Key West-based Artificial Reefs International to haul the sub on a barge to Florida and attach it to the ocean floor. The money would come from registration fees paid by Florida boat owners. Cold War sub would sink off Jupiter, become Florida’s first sub artificial reef (01/04/2017) Palm Beach County plans to take possession of the USS Clamagore, the “Gray Ghost of the Florida Coast,” and sink it in about 100 feet. The museum decided the sub deserved a better fate than a scrapyard and signed a deal last spring with Artificial Reefs International-Clamagore, a subsidiary of Miami-based CRB Geological and Environmental Services, to find a home for it somewhere in the ocean, ARI principal Joe Weatherby said Tuesday. Joe Weatherby Sinks Ships And Transforms Them Into Thriving Marine Ecosystems (6/09/2016) Rabble-rouser, peacemaker, folksy charmer and irresistible force of nature, Joe Weatherby has a passion for sinking ships and saving our seas. Patriots Point takes step closer to sinking Clamagore (5/20/2016) The Patriots Point Development Authority voted today to give exclusive rights to Artificial Reefs International to find an entity that will convert the USS Clamagore into an artificial reef. Key West business, Jewish Leaders represent US in Cuba (5/14/2016) Jeffrey DeLaurentis meets with Key Westers, Donna and Bob Harvey, and Joe Weatherby at the diplomat’s home in the Cubanacan section of Havana, Cuba. 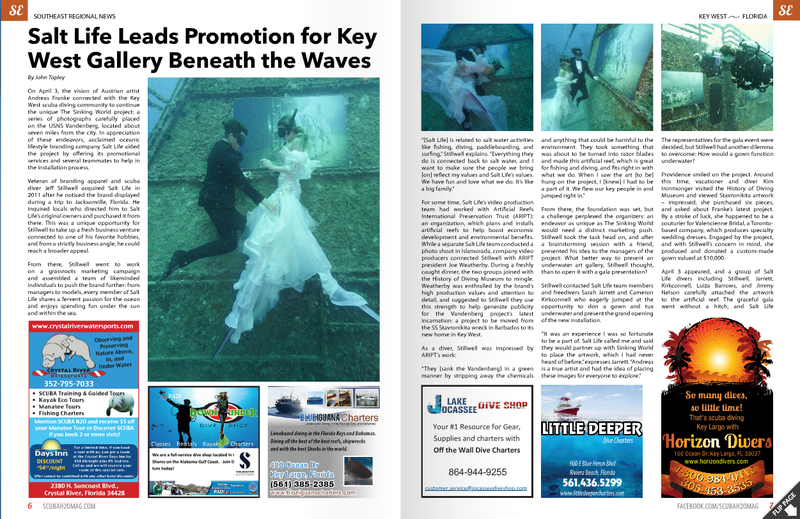 Underwater Art Gallery Debuts Off Key West (4/4/2016) An underwater art exhibition has debuted on the world’s second-largest artificial reef, the 523-foot Gen. Hoyt S. Vandenberg, lying in the Florida Keys National Marine Sanctuary about seven miles south of Key West. 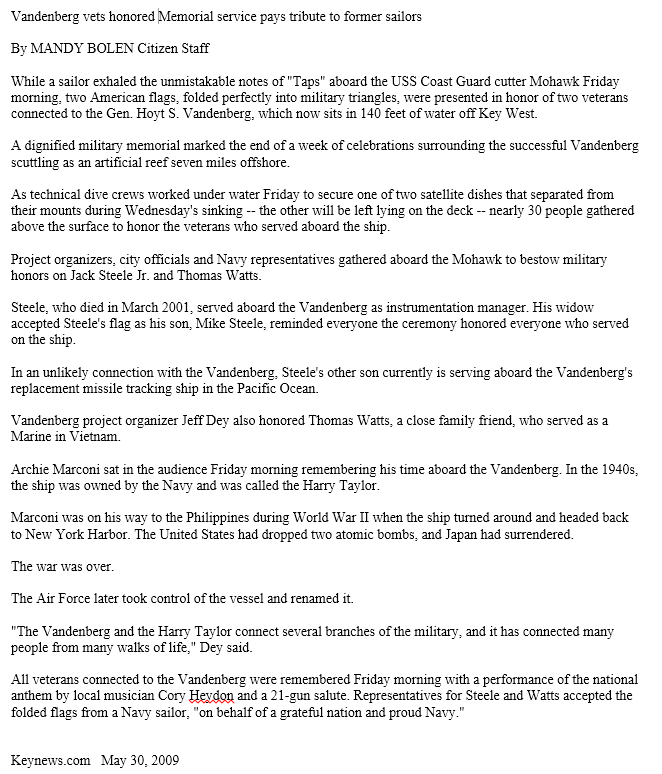 Diving into Art (3/10/2016) The USNS Gen. Hoyt S. Vandenberg will once again be transformed into one of the longest under water art galleries, as world-renowned artist Andreas Franke will display 12 pieces of art on the wreck off Key West. DEMA Show 2015 Showcases Ships 2 Reefs Effort (11/05/15) Artificial Reefs International is working on developing the future of the SS United States, which if they cannot find a way to keep it afloat, will become an artificial reef to avoid just ending up in a scrap yard. 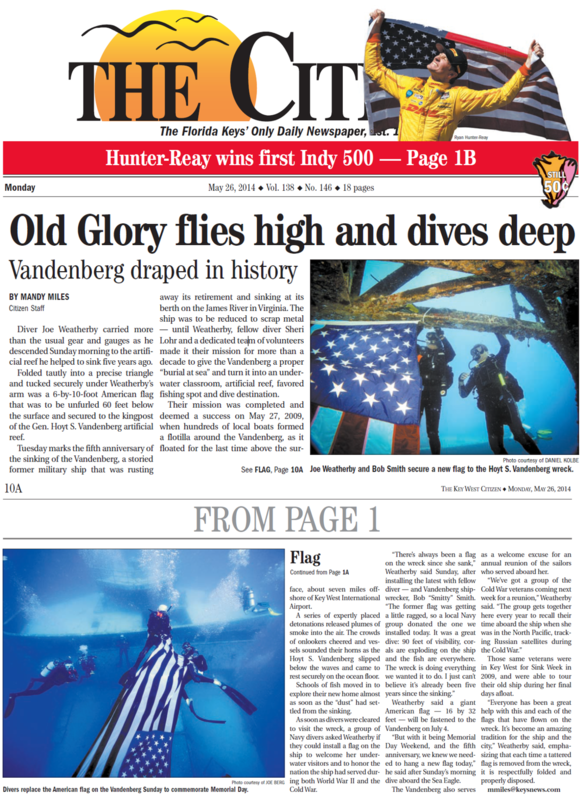 America’s flagship issues SOS (10/23/15) Captain Joe Weatherby sinks ships for a living, preserving impressive hulking behemoths like the Vandenberg for use as artificial reefs and underwater classrooms. The Future of Artificial Reefs by Joe Weatherby (September 2015) Artificial reefs come in many shapes and sizes and can typically be made to fit any environment or any environmental or fishery goals. USS Mohawk assists in manufacturing rum to benefit veterans and the environment (6/02/15) Lee Reefs and Wicked Dolphin Distillery partner to create a rum that starts 90 feet below the surface of the Gulf of Mexico. Vandenberg vets honored Memorial service pays tribute to former sailors (5/30/09) While a sailor exhaled the unmistakable notes of “Taps” aboard the USS Coast Guard cutter Mohawk Friday morning, two American flags, folded perfectly into military triangles, were presented in honor of two veterans connected to the Gen. Hoyt S. Vandenberg, which now sits in 140 feet of water off Key West. © Artificial Reefs International 2019. Unauthorized use and/or duplication of this material without express and written permission from this site’s author and/or owner is strictly prohibited.